I've got a lot to say about this dovetail template but let me mention Richard Stottmann first. He's the innovator behind Stots Corporation. This fellow is a woodworker just like you and me. He has faced problems which have arisen in his work, thoughtfully figured them out and now he shares them with us. I read the inside cover of the manual, and got a glimpse of his personality in his P.S. concerning lawyers. Then there was his Honor Statement on the inside back cover... this guy just wants everyone to be able to cut dovetails, cheaply, and correctly! I'm thinking that his business is just an offshoot from that, at least those are my thoughts on it. I like him! This is 30 pages of very clear, concise instructions. Starting at an Anatomy of a Dovetail Joint through a troubleshooting section, Mr. Stottmann leaves nothing out. His section on making a working jig are exemplatory and it doesn't stop there - knowing all woodworkers aren't the same, he gives you a second option in Method 2 which builds upon the 1st. In both these Methods, you have options of 1" spacing or 2" spacing. I chose Method 2 with 1" spacing as this seemed the best setup for me. My dovetails were to be in 10 drawers for two chests which I'm building. (I also figured that I could go to 2" spacing if I chose to.) Following his making of the working jigs comes the test cut, and how-to section. These pages are followed up with adjustments - how to fine tune for that perfect joint. Once again, he spells it out so all can understand and then accomplish this with no fuss. Next we're taken through the joints the Dovetail Template Master can do: half blind, (more on this joint later) through dovetails, angled dovetails, box joint and hinge joint. By the time the working jig is done, you already have a handle on what you're doing; these sections just reinforce your knowledge. You're all set, great instructions! Having read the instructions you see the simplicity of Mr. Stottman's system... you're using his jig to fashion your own so when you mistakenly, (oops, Dang it #%@*) route it, not all is lost. I picked MDF for my working jig, and decided on 1" spacing. I also went for Method 2, which gives you a jig twice as long, but not in sections. (if you make a mistake, you replace the whole thing, careful Doug!) Since the 2" spacing is arrived at by deleting every other 'bar' in the jig, I thought that I could retrofit that way but couldn't add them back without making another jig. In the instructions, he says to screw the template down. I'm saying, 'Make sure its SECURE!'. There is a lot of force when you're routing this out. (This might be where MDF, notorious for its lack of screw holding ability is not the best choice. Stottman lists Plywood or solid wood - I didn't want to risk any voids.) You also make a backer board that's 2-1/4" wide. To get this laminated thickness ply will not work, its undersized, make sure of your thickness here if gluing up. I once again chose MDF, 3/4" thick to glue up - a straight forward operation. Attach your backer to the working jig at right angles and you're ready for a test cut. Here is where you'll be switching back and forth between your dovetail bit and straight bit, as you do the one time only tune up. Its all listed in the instructions, move the working jig in relationship to the backer board one way if they're too tight, the other way if they're too loose. On the third try my test tail board fit my pin board perfectly! Then you're all set, no need to test again. Alignment of the pin board is done as a relationship of the tail board. This might be the only awkward part. You scribe the tail locations onto the end grain of the pin board, then align with the fingers of the working jig. This, however, harkens to the methods used in hand cutting dovetail joints, so its not all bad. When doing multiplies, time can be saved by clamping stops to the backer board. The Stots system is like other dovetailers; its a template system for router bits. I got bearings for my bits instead of a template guide bushing. All you do is follow the template guide, which you create from the master jig, with the appropriate bit. It's best to organize all your pin boards and tail boards and then mark their orientation prior to cutting. With a set spacing, (in my case 1") if you have different height drawers you will find that if you work from the center out, you will not always have the same start, either a tail or a pin.This could interfere with the bottom groove so try to plan ahead for your spacing. Once you're organized, its just a matter of making all your tails first with the dovetail bit and then changing over to your straight bit for making all your pin cuts. In between you need to mark your pin boards for clamping to the template. The alignment is always right on, due to the test cuts mentioned above, and bit height is easy to set also leading to stacks of ready-to-assemble dovetailed parts. This is probably the only place I disagree with Mr. Stottmann. The instruction book says to make the half blind joint from 2 boards: a regular pin board and an "appearance" board. It recommends gluing the appearance board to the pin board, to cover the end-grain of the tails. 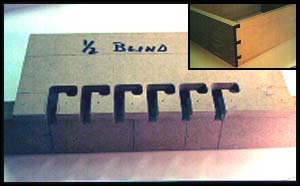 An example would be a 1/2" pin board, and a 1/4" appearance board, totaling 3/4". This seemed to me a too round about way to make this very necessary drawer joint. Taking a bit of my time and using the idea behind the Stots jig, I fabricated my own template to cut this joint. This home fabricated jig is based on 2" spacing and cuts with only 1 bit - the dovetail bit. In it, like other half-blind dovetailers, the pin and tail board are cut at the same time. The tail board is clamped vertical and the pin board is clamped on the other side of the jig, in a horizontal position. The bearing bit follows the template in a J shape, routing the opening for the pin and then the recess for the 2" tail. I gained a lot of respect for Mr. Stottmann while fiddling with this cobbled together template. I was impressed with his thoughtfulness and patience in devising and bringing to market a dovetail template of reasonable cost. One has to do a lot of head scratching to get things just right! I would recommend buying this template for a number of reasons. But first, let me explain how I had previously done dovetailing. I don't do a great deal of dovetailed drawers or case pieces so I would either hand cut or use a combination of band and table saws, along with chisels to get this desirable joint. And since I don't do many, they were slow and real labor consuming. Now, with Stots Corp's jig, I can cut dovetails in various thickness material and get perfect results. It is very systematic, able to handle multiples with ease and you can vary the dovetail spacing to suit your style. And you can do this and spend way less than other template jigs! I also like Mr. Stotman's approach; I think using a little of your own ingenuity, you can develop the system to your very own specs. A heartily recommended buy! Editor's note: Doug Smith is a professional woodworker and webmaster. His homepage is packed full of interesting woodworking information. The Dovetail Template Master is available for $39.95 from Stots Corporation.